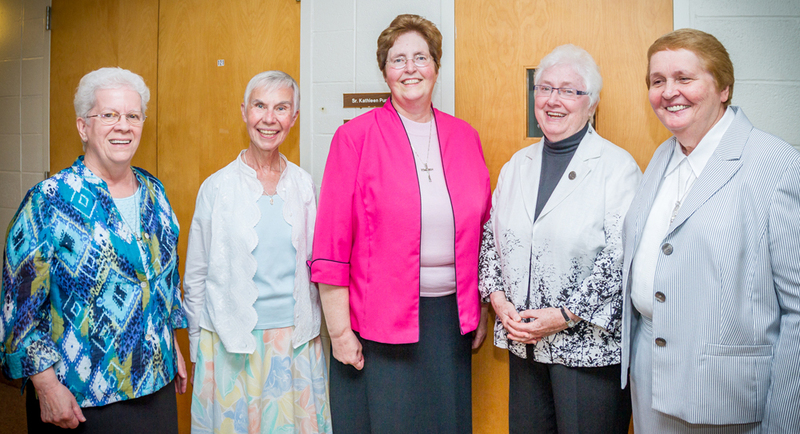 Members of the current Leadership Council of the Grey Nuns in the Philadelphia Archdiocese include (from left) Sister Mary Elizabeth Looby, Sister Diane Bardol, Sister Julia C. Lanigan (president), Sister Cecelia Cosgrove, and Sister Elizabeth Dawn Gear. Many religious congregations for men and especially for women are facing daunting challenges at this time due to societal changes which have resulted in a dearth of new religious vocations. What happens when there is no longer a sufficient number of idealistic young entrants to serve the schools, health care facilities, homes for the aged, orphanages and other ministries founded by those who came before? What happens when there are no younger sisters to help care for the aged sisters who served so faithfully in years past? Recently the Sisters of the Blessed Sacrament, facing this challenge, announced their motherhouse would be placed for sale. Another congregation that has made a distinguished contribution to the Archdiocese of Philadelphia, the Grey Nuns of the Sacred Heart, reached that decision five years ago. They sold their generalate at 1750 Quarry Road in Yardley to Holy Redeemer Health System but leased it back until this year, when the sisters relocated to other facilities, according to Sister Julia Christine Lanigan, the Grey Nuns’ president. Their roots go back to 1737 in Canada and the founding of the Sisters of Charity of Montreal (who were commonly called Grey Nuns) by St. Marguerite D’Youville. Her charism, despite daunting opposition, was primarily to serve the poor, a charism to which her spiritual daughters remain faithful almost three centuries later. At this time there are six branches of Grey Nuns descending from that original ministry — five in Canada and the Grey Nuns of the Sacred Heart, which were founded across the border in Buffalo, N.Y., in 1921 as an independent English-speaking branch to minister in the United States. One of their first American ministries was the establishment of D’Youville College in Buffalo in 1908, which continues under Grey Nuns auspices to this day. It was Cardinal Dennis Dougherty, a former Bishop of Buffalo, who invited the sisters to establish their motherhouse in the Philadelphia Archdiocese, which they did in 1922. At first it was in Elkins Park then in 1966 to the larger property in Yardley. Among their local institutions were Grey Nuns Academy, Yardley; Melrose Academy, Melrose Park; and D’Youville Manor, an assisted living facility, along with a number of convents scattered around the archdiocese. Sisters formed in this area went out to serve in ministries throughout Pennsylvania, New York, Maryland, North Carolina, Massachusetts, Georgia and as far away as Alaska. Most of the Grey Nuns currently living in the Archdiocese of Philadelphia are technically retired although some of them are participating in volunteer ministry working with the poor just as St. Marguerite herself did before establishing her congregation. A number of them, 48 at this point, are living in independent living facilities at Holy Redeemer Lafayette on Veree Road in Philadelphia, with a much smaller number in other personal care or skilled care facilities. There are a few sisters in full active ministry and many in part-time ministry, while others have reached a point where theirs is completely a ministry of prayer. Their administrative offices are now at 14500 Bustleton Avenue in Northeast Philadelphia, not far from Holy Redeemer. Whatever the future, the Church of Philadelphia owes these sisters and other similar congregations a debt of gratitude that can never be fully repaid. 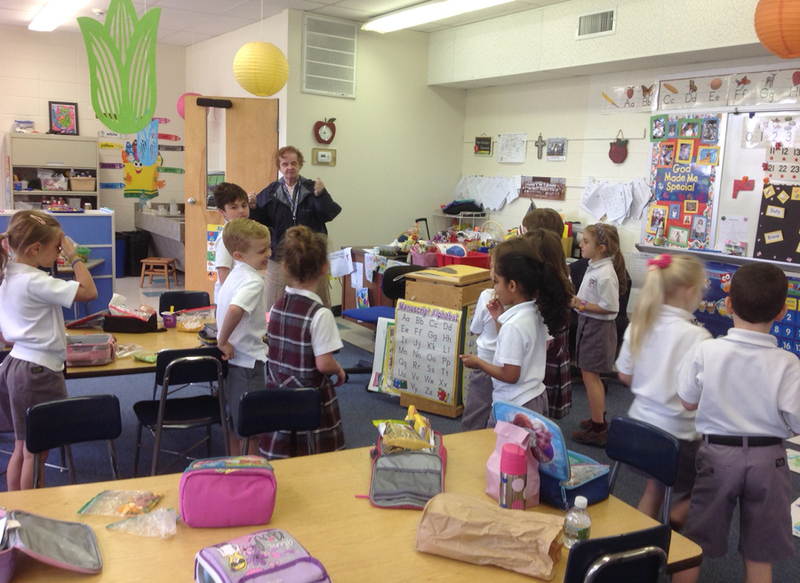 Sister Dolores Beatty, G.N.S.H., leads young students at Grey Nun Academy in Yardley, a pre-K to eighth grade Catholic school run by the Grey Nuns of the Sacred Heart. I honestly find it hard to feel sorry about the loss of religious sisters in some of these communities. When they freely chose to abandon the very things which identified them as religious women – living in community, common ministry, religious habits and the often so called “trappings” of religious life, they truly lost their sense of identity. Many of these women wanted to blend in so much with modern society that they made themselves obsolete. I am not questioning the faith and generosity of these women; just the choice they made to kill their communities. What are we left with now? A group of senior women who identify their ministry as ‘social justice’ riding around on the “Nuns on the Bus tour”. What could possibly be left for a young woman to even consider joining one of these groups? May they RIP soon and a new wave of religious sisters spring forth! There are still vocations happening! The Sisters of Life are a growing order with young vibrant girls who want to spread the true teachings of the church!! Their habits are beautiful and so are their smiling faces! Why would you join an order that did not require you to wear a habit? You want the world to know you are a Bride of Christ! I pray each and every day for vocations to the priesthood and religious life. Unfortunately, the modern world does not value the vows of poverty, chastity and obedience. These are contrary to the message of liberal education, music, TV, and social media. None of them is wearing their uniform and veil. I know its modern but congregrations should keep to the traditional otherwise all is lost. If they don’t show a good example who will follow them? If a priest showed up at Mass in a t shirt and trousers and without his cassock, vestments and stole what would you think of him? You are right. This is due to Vatican 2 + democratic ideals on RIGHT TO CHOOSE when many things went haywire. If Saints Francis and Clare were alive what would they think? They deserve their congregation to end since they do not set a good example even in their dress code. If they do not keep to the dress code what other “rules” did they/will they violate? Over the years despite their good deeds few appreciated them otherwise their order would be overflowing with vocations. As someone devoted to the Grey Nuns, having been educated at Melrose Academy in grades K-12 and then 2 years at D’Youville College, this breaks my heart. I am devoted to the good Sisters and the foundress, Marie Marguerite d’Youville, and mourn the passing or each former teacher. Only one remains. I was devastated when the Melrose mansion was torn down, when the school closed and moved to Yardley and the property sold, but this is even more devastating. What a shame. RIP Sr. Mary Veronica, Sr. Naala, Sr. Helen Rita, Sr. Mary Josephine and others. You educated a good woman, adding greatly to what I learned at home from my parents. In 6th grade, my beloved Mom went to a TB sanitorium and Sister Robert Patricia extended more loving care than anyone could expect from a teacher. She helped me through a difficult year living with my grandparents and I had the absolute joy of having her again for 8th grade. While she is no longer in the order, we have remained in touch since I graduated high school in 1964. My children’s “Macs” and “St. Joe” nuns were very tired of my telling them that they were nothing like my beloved Grey Nuns! To each and every one of you, my sincere and heartfelt thanks. I remember very fondly the Grey nuns teaching at Little Flower H.S. and always admired their dedication and spirit. Only the Holy Spirit knows what the results of that endeavor and so many others will foster. God bless all of you and your future. It is about time, and past time, that the congregations of women Religious who belong to the organization of rebellious women Religious, said by the Church to number 80% of women Religious, and by their own figure, 90% of women Religious, disband. By the charity and respect for their hard and loyal work in the past, the Church has not suppressed them heretofore. Before St. Teresa of Calcutta founded her own Order, she called her previous Order “too rich.” This is so for these properties of such women Religious. Taking a cue from the great sacrifices of the Archdiocese, they should sell off their motherhouses, campuses, and other holdings. Primarily, however, these Orders should dissolve themselves. They are unfaithful to the Magisterium of the Catholic Church, in some cases openly undermine the priests’ teaching when they are given the paid position of pastoral care, and in particular do not support the male priesthood. Any good work they do is social work. As St. Teresa of Calcutta said, Sisters are not social workers. Their first and essential mission is obedience to the Church. A woman Religious who found herself in one of these rebellious Religious Orders had two choices: either leave and join another, a faithful, Order, or stay put and reform her congregation. As one grows, they become more aware. That is what education is about…growing, learning and changing. The key here is the word “changing.” As a priest said to me once, “if you want to know what is going on in the church ask the Sisters because they read and keep up.” .We will always have those “rebel” against change because it means they need to leave a comfort zone. But that is no excuse. Change for the sake of change is not good; change as a result of understanding your mission better, or you church history better should result in a more satisfying experience within yourself and your church. Remember, the church is a community of believers: people of God who just want to do their best to serve other people not buildings, clerical robes, habits or positions in the church. Please listen to what the “rebellious” ones are saying and open you heart to listen. You may find a space for yourself. Agreed Emma. You are spot on! Sister Dolores Beatty taught me Economics my senior year at Bishop McDevitt HS. She is the reason I went on to major in Economics at Temple University. Best teacher I ever had! I,too, had Sr. Dolores Beatty at McDevitt back in the early ’80s. She was a great teacher and a very friendly person. By the ’80s the Grey Nuns had given up their habits but Sr. Dolores had her own version: a double sided apron of the same color of their former habit which she wore over a secular dress along with the beautiful large silver crucifix of the congregation. She also wore a black veil which was the same material of former habit. For ANY vocation, encouragement needs to begin first at HOME, then in school. I’ll never forget hearing a homily and Father stated the #1 reason for lack of vocations: parental opposition. Nonsense. parental opposition – that is a lame excuse and excuse to GIVE UP! Ask any Spiritual Director or Formator. With time and tact all parental opposition can be overcome. My friend is a convert from Buddhism.. His Buddhist parents objected streneously partly because of the sexual abuse scandals worldwide. In the end they relented. At the ordination the parents sat in the front row. The bishop congratulated and thanked them for “Offering their son to the service of GOD’S MINISTRY especially AT THIS TIME!